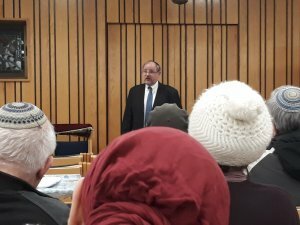 Rabbi Professor Michael Broyde served as Scholar-in-Residence over Shabbat Jan 19, 2019 in The Central Rimon synagogue of Efrat, sponsored by the Agunah and Get-Refusal Prevention project of IYIM. The two lectures delivered to the members of the community were both unique to Rabbi Broyde’s expertise – which in addition to Rabbi Broyde’s clear explanations of complex subject matter– provided an unparalleled experience for the participants. The first lecture, “Contending with Catastrophe: the Agunot of Sept 11th” provided a fascinating, and at times mesmerizing, glimpse into the halakha and methodology used so sensitively to resolve the plight of agunot whose husbands were killed in the horrific tragedy, but with no bodies to be found.Not only was Rabbi Broyde’s presentation illuminating, it was also a moving experience to witness a Rabbi who was able to take away so much of the pain from the victims’ families. In the second lecture – “The Tripartite Agreement” was presented by Rabbi Broyde and its mechanisms explained as to how, if signed before the wedding, it can prevent the classic agunah—the woman whose husband cannot give a get due to his disappearance, lying in a permanent vegetative state or probable death without proof of his demise. Protection of our daughters is in our hands. We are a registered non-profit organization under section 46 in Israel and 501(c)3 in the United States. Gift Aid is also available for donations made in GBP.